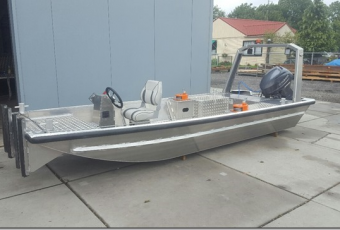 If you are looking for a versatile all round workboat this will be the one, with its flat bottom and shallow draft this boat takes equipment and people around the work area. 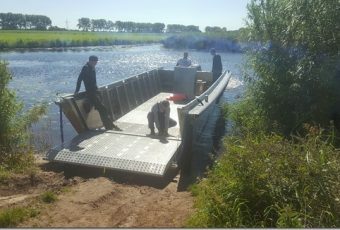 Pushing pontoons, inspection water depths and fast response are the main features of this boat. Equipped with LED work lights, Coupling winches, Captains Seat and many other options! This aluminium pleasure boat is suitable for 5 persons, you can take your family everywhere, this boat will do all you desire! This HasCraft 1100 Landing Craft is designed to transport your rolling equipment from A to B , small diggers, mowing equipment, cars and trailers can be transported by this landingcraft. Equipped with a wide door and a electric winch. With its draft of only 25 cm empty it can bring you anywhere. If you are looking for a versatile all round workboat this will be the one. 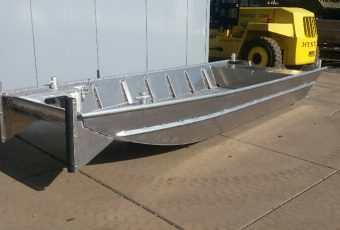 With its flat bottom and shallow draft this boat takes equipment and people around the work area. Pushing pontoons, inspection water depths and fast response are the main features of this boat. Equipped with LED work lights, Coupling winches, Pilot Seat, Piling hole and Spud Poles. 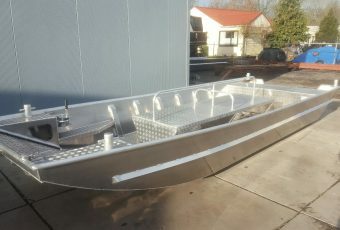 This boat can not only push pontoons but can also be used as a water research boat! 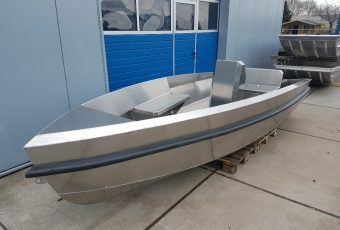 Our first Full New Model pleasure boat in the range of our aluminium boats, suitable for 8 people you can take your family everywhere, this boat will do all you desire! 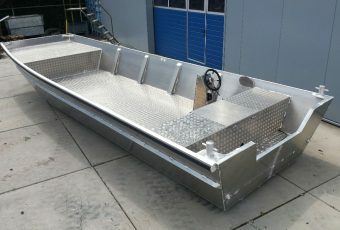 This HasCraft 600 with front loading ramp is ideal for diving companys and marine works. 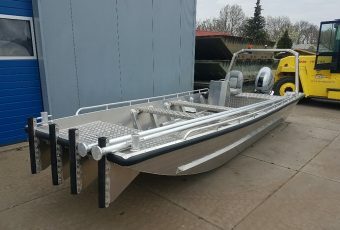 Easy access into the boat and road transportable, the boat can be equipped with your options, the boat on the pictures has a removable middle bench to create extra seating when necessary. This HasCraft 900 Landing Craft is designed to transport your rolling equipment from A to B , small diggers, mowing equipment, cars and trailers can be transported by this landingcraft. Equipped with a wide door and a remote controlled electric winch. With its draft of only 15 cm empty it can bring you anywhere. 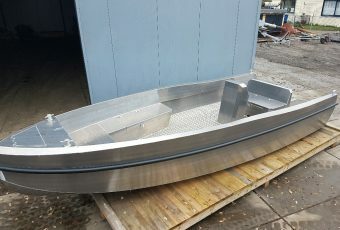 If you are looking for a versatile all round workboat this will be the one , with its flat bottom and shallow draft this boat takes equipment and people around the work area. Pushing pontoons, inspection water depths and fast response are the main features of this boat. 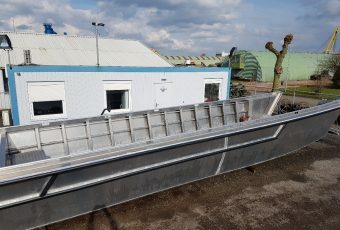 The HasCraft 700 Standard, a very stabil and heavy build boat it will carry all your equipment save from job to job, still road transportable, free of maintenance and with shallow draft so it can be used around all related marine works. 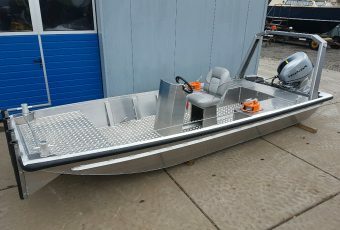 The HasCraft 500 Landing Craft has the ultimate “walkout” of all boats , with the manual controlled winch the bow door can be lowered in all positions to secure a save and steady walkout, carry your equipment in and out the boat is very easy with this feature!